Not all kilt wearers are Scotsmen, or indeed Irishmen, in fact you can find men in many different countries across the world wearing kilts. As someone who has worn a kilt for many years, it's easy for me to forget that some men are a bit apprehensive about wearing a kilt for the first time. So with that in mind, let's look at some of the benefits associated with wearing a kilt. It's a fantastic way to celebrate your Celtic heritage, but if you don't have any, don't let that stop you. Most people try to find a tartan that is associated with their family name, but for those that can't, there are many generic tartans available. 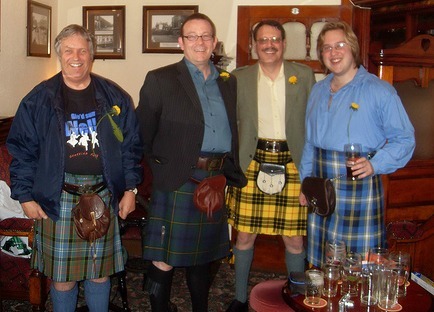 Below you can see a photo showing a variety of clan tartans. They are from left to right the Paisley tartan, the Johnson tartan, the Mcleod tartan and the Halesowen Tartan. These Gentlemen were photographed enjoying a night out in the Black Horse Pub, in Preston, England. And I'm a firm believer that you don't have to be a clan member to be entitled to wear a clan tartan, there are no tartan police, so wear what you want. It is the only garment I know that never goes out of fashion. 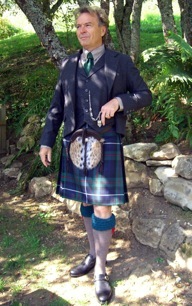 Women love men in kilts, but don't take my word for it, try one for yourself. The sense of freedom you get, that can only be experienced by kilt wearers. A good quality kilt will last a lifetime (do you know of any other garment you can say that about)? A kilt is more versatile than any other item of clothing. You can dress your kilt up, to give you an outfit suitable for the most formal of occasions, and you can also dress it down for a totally casual look, as in the photo below. 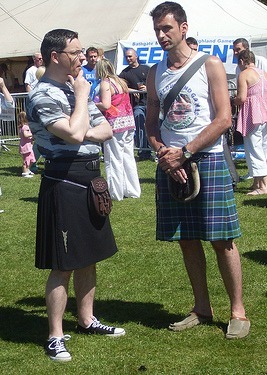 These two Gentlemen are enjoying the sunshine at the Bathgate Highland Games, and have decided to dress their kilts down to keep them cool in the heat. Below you can see a photo of Robert wearing one of his kilts, the outfit he has chosen would be considered typical day wear. Robert from France, is a regular visitor to this web site. So are there any disadvantages to wearing a kilt? Well, I've heard it said that the cost of having a kilt hand made, is to expensive for some people. And while it's true that a quality kilt is not inexpensive, when looked after you will get a lifetime's wear from it, so it is a worthwhile investment in my opinion. A man in a kilt definitely draws a lot of attention, so be prepared to be asked "what are you wearing under your kilt"? or some similar question. Maybe the last point should be included in the list of positive aspects, you decide for yourself. Kilt wearers stand out from the crowd, they are self assured and mostly like to be in the spotlight. And they love to discuss all the different aspects of wearing a kilt, from which tartan to choose, through to which accessories are best for each occasion. So much so that there are several forums on the web dedicated to kilt wearers, most of which have large membership numbers, from many different countries. My best advice if you are unsure if a kilt is right for you or not, is to try one on, go out and rent one for a weekend, you will be amazed at how comfortable you feel wearing it. And the positive comments you will receive from others will reinforce what I have said, men who wear kilts really know how to enjoy life. If you have any questions regarding this page, or any other kilt related matter, please feel free to drop me a line using the "Contact Us" page, I enjoy feedback from my visitors.